Ana Figueroa Redeeming Your Promo Code: 1.Place all of your qualifying items into your shopping bag. 2. Type the Promotion Code into the Promotion code box in your shopping bag. 3. Click apply to see discount. Cole Martinez I've been waiting for a sale like this! Johnny Cash Title of agreement corrected. 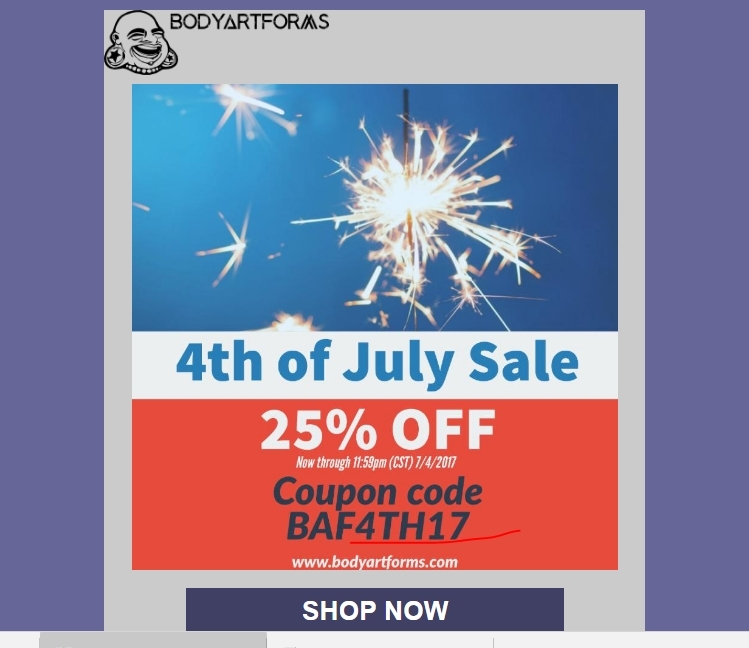 Get 25% Off Site Wide at Bodyartforms store by accessing the website www.bodyartforms.com and adding the promotional coupon ''BAF4TH17'' in the coupon box at the time of processing your payment. This offer is valid for a limited time. This coupon can not be combined with other discount coupons. This offer is not redeemable for cash or gift cards. The Bodyartforms store takes the right to modify or cancel this agreement at any time. There may be some exclusions that apply to this agreement. For more information, see the screenshot. Monta Applied coupon at checkout and received my 25% off. The code is right on the homepage so you know the deal is legit. Laura DeLuca Offer Expires at 11:59pm (Central time) on July 4th, 2017. Coupons are not stackable. 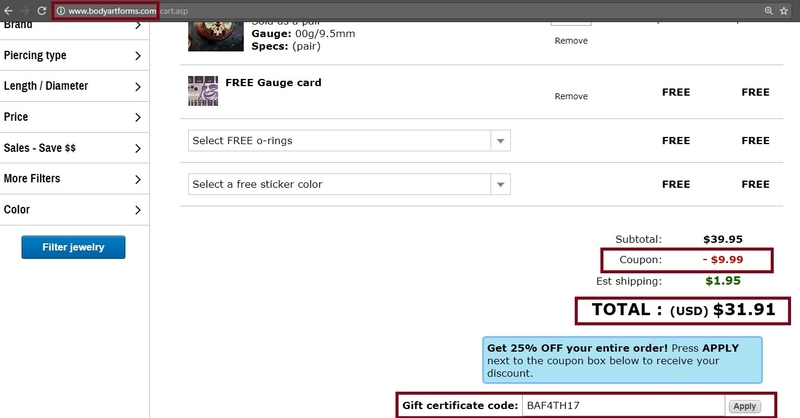 Coupon can be used on multiple orders. Not applicable on sale exempt items.